CIXI, China -- A 36-kilometer (22-mile) bridge that its builders claim is the world's longest sea-crossing structure was formally linked-up Tuesday just south of the business hub of Shanghai. The bridge links Shanghai to the industrial city of Ningbo across Hangzhou Bay, cutting the distance between them from about 400 kilometers (250 miles) to just 80 kilometers (50 miles). Officials welded together a final section to complete the link at a ceremony attended by several hundred workers from the various companies building the bridge. Costing 11.8 billion yuan (US$1.54 billion;euro1.14 billion), the structure will open to traffic next year following completion of the six-lane roadway that will permit vehicles to travel at speeds of up to 100 kilometers (62 miles) per hour. The bridge, a mix of viaducts and cable-stayed spans to allow shipping to pass beneath, lies just south of the Yangtze River Delta, one of China's most economically vital regions which is undergoing a massive construction boom aimed at boosting transport links. 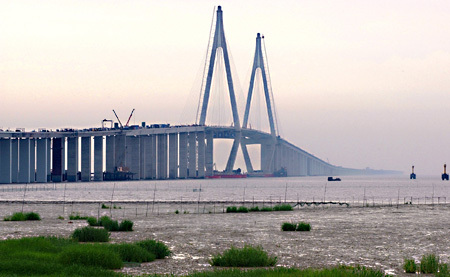 Just north of Shanghai, builders this month connected the final link in a 32.4-kilometer (20.13-mile) bridge across the Yangtze, said to be the longest cable-stayed structure of its kind. The 32.5-kilometer (20.2-mile) Donghai Bridge had been the previous longest sea-crossing structure, linking Shanghai to the massive Yangshan deep water port. Construction on the Hangzhou Bay Bridge began in 2003 with a percentage of its financing coming from private sources, a first for such a large Chinese infrastructure project.